Again, Welcome! Thanks for visiting our site. We have been working hard over the last year and half to bring 3D Shed Builder into a reality. We have received such great feedback from so many and we truly appreciate that! At the moment we have a contract to fulfill with 6 great US based companies so we cannot take on any more clients at this point. However, if you have a business that could utilize 3D Shed Builder please send us an email. We'd love to hear from you. 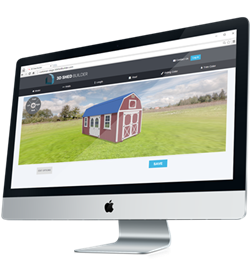 3D Shed Builder creates a custom 3D Design website for your portable shed brand. We document your models, sizes, and options then recreate them into 3D Models. This means the sky is truly the limit. 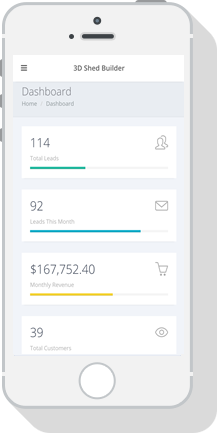 The site allows your customers to design your buildings and save them to their dashboard. This creates a lead. Once the client saves the design they are taken to there dashboard and are allowed to create additional design or edit the design they saved. In the background the lead is matched to the closest dealer and the system sends the lead's information to the Dealer's Dashboard. The Dealer Dashboard is where the real magic happens. The dealer is able to see his leads and the designs those leads have saved. The dealer can print the 2D floor plan of the building, add sales to leads, and so much more!